The Saints are promoting running back Dwayne Washington from their practice squad, according to Ian Rapoport of NFL.com (Twitter link). New Orleans won’t see Mark Ingram return from suspension until Week 5, and the club is still searching for a viable backup to lighten the load on starter Alvin Kamara. Through three games, Kamara has handled 81% of the Saints’ running back snaps and 79% of the club’s running back touches. Reserves Mike Gillislee and Jonathan Williams haven’t contributed much, and one could conceivably be cut in order to create a roster spot for Washington. Washington, 24, was selected by the Lions in the seventh round of the 2016 draft. After appearing in 12 games and toting the ball 90 times (for an unappealing 2.9 yards per carry) during his rookie campaign, Washington’s playing time dropped precipitously in 2017, when he managed only 20 carries in five games. 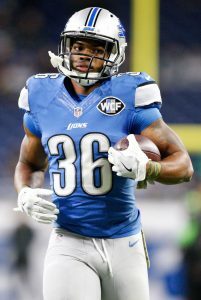 He was released during final cutdowns earlier this month, pushed off Detroit’s roster by the club’s crowded running back depth chart. Even if Washington doesn’t see much work behind Kamara, he could still help on special teams, as he handled two kickoff returns in each of his two seasons with the Lions. However, the Saints re-signed wideout Brandon Tate earlier this week, and he figures to take on return duties for New Orleans. Well-traveled backup quarterback Dan Orlovsky re-signed with the Lions this offseason after spending 2015 as the team’s No. 2 signal-caller behind Matthew Stafford. However, the Lions drafted Michigan’s Jake Rudock in the sixth round of this year’s draft–the first time Detroit has drafted a QB since selecting Stafford himself in 2009–and that selection immediately put Orlovsky’s job in jeopardy. After all, new GM Bob Quinn was raised in a Patriots system that typically keeps just two quarterbacks, and rarely has the backup been a veteran. But Dave Birkett of The Detroit Free Press writes that both head coach Jim Caldwell and OC Jim Bob Cooter sang Orlovsky’s praises after the conclusion of OTAs on Thursday, and as Rudock is a fairly raw prospect, the Lions may wind up keeping three quarterbacks in 2016, or even trying to stash Rudock on the practice squad. In any event, it is far too early to count Orlovsky out of the picture. Detroit selected running back Dwayne Washington in the seventh round of this year’s draft, but because NFL policy prohibits college players from practicing with their new teams until their academic year is over, Washington’s first OTA practice on Thursday was the team’s last OTA practice, which puts him at a major disadvantage. However, as Tim Twentyman of DetroitLions.com writes, Washington’s speed was on full display on Thursday, and Washington himself indicated that the practice went as well as could be expected. Speaking of Washington, Michael Rothstein of ESPN.com says the former University of Washington Husky could insert himself into the team’s running back equation, but if he had to handicap the RB race right now, Rothstein believes Ameer Abdullah, Theo Riddick, Stevan Ridley, and Zach Zenner would make the club (although Ridley’s and Zenner’s spots are certainly up for grabs). In the same piece, Rothstein says Alex Carter, last year’s third-round selection, is expected to be a significant part of the Lions’ cornerback rotation. Carter suffered an ankle injury during the early stages of training camp last season and did not play a single snap for Detroit, but Rothstein pegs him as the team’s No. 4 corner behind Darius Slay, Quandre Diggs, and Nevin Lawson. We learned several days ago that Stephen Tulloch is still unsure as to whether he will be on the team in 2016, and we also learned that the Lions waived wideout Corey Washington with an injury designation. Defensive tackle Maliek Collins announced that he is entering the NFL Draft and foregoing his senior season at Nebraska, as Sam McKewon of the World-Herald writes. Collins, a team captain in 2015, racked up 29 total tackles with 2.5 sacks this season. Many have projected that Collins will go in the first round of the NFL Draft this season and his grade from the NFL draft advisory board likely supported that forecast. UCLA Bruins junior defensive tackle Kenny Clark announced on Twitter that he will skip his senior year to declare for the draft. NFL talent evaluators are high on the 6’3″, 310-pound junior and he could wind up being a late first-round pick. Clark recorded a sack and season-high eight solo tackles in UCLA’s bowl loss to Nebraska on Dec. 26. For the season, he had 47 tackles and six sacks. Indiana junior running back Jordan Howard announced that he will forego his senior season and enter the 2016 Draft. A first team All-Big Ten selection, Howard entered the bowl season second in the Big Ten with 134.8 rushing yards per game (9th nationally) and 146.6 all-purpose yards per game (15th). Injuries have been an issue for Howard in the past, but he is considered by some to be one of the five best tailbacks in this year’s class. One has to imagine that his medical exams will play a big factor in where he lands. University of Miami junior cornerback Artie Burns announced that he has elected to forgo his final year of college eligibility and declare for the draft. “After considering all the options, and looking into my future, I feel it is in my best interest to forego my senior year and declare for the NFL Draft,” Burns said in a statement. “I can’t put into words what these past three years have meant to me in my development as a football player but even more importantly as a man.” Burns could wind up as a consensus top five corner in this year’s class depending on what others at his position do. Arizona Wildcats wide receiver Cayleb Jones took to Twitter to announce that he is going pro. The 6’3″ athlete is rated as the No. 23 junior wide receiver prospect by NFLDraftScout.com and he appears to be taking a risk by jumping to the NFL. Jones originally committed to the Texas and played in 10 games as a frosh before transferring to Arizona and sitting out for one year. While at Texas, Jones picked up a felony assault charge that was ultimately reduced to a misdemeanor. The Texas Longhorns announced that junior defensive tackle Hassan Ridgeway has decided to go pro. An honorable mention All-Big 12 selection in 2015, Ridgeway played in 36 career games with 18 starts. In that time, he recorded 92 tackles with 9.5 sacks, 18.5 tackles for loss and two fumble recoveries. Ridgeway is rated as the No. 5 nose tackle by WalterFootball.com and his stock could rise if any of the three underclassmen ranked ahead of him opt to stay in school. Washington junior running back Dwayne Washington will forgo his senior season and enter the NFL Draft, as Adam Jude of the Seattle Times writes. Washington did not play in UW’s final four games because of a knee injury, an issue which required minor surgery. The tailback started six games for UW this season and finished as UW’s second-leading rusher with 282 yards. His seven total touchdowns were also second-most on the team. Washington garnered attention in 2014 when he converted from wide receiver to running back, though his frame still looks like that of a receiver.